Time For A Sparkling White Smile In Lakeview! It’s a wonderful day because it’s Friday! Over here at Sugar Fix, we are gearing up for the weekend after a productive week here! We got down to business, as the weather is getting better and teeth are getting whiter! A patient of ours was interested in brightening up her smile for the spring season, and we couldn’t have been more excited for her. In-office whitening is a great way to boost your smile and it only takes a few hours. We offer ZOOM Whitening, which is four, 15-minute sessions, and you can achieve AMAZING results! Take a look below! 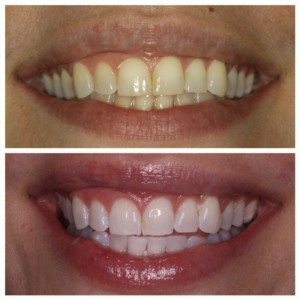 This week, we also started two new Invisalign cases! Both patients were looking to do some minor corrections – crowding, some overlapping, and just overall alignment. We see this as a common problem, when you had braces as a teenager, but then don’t end up wearing your retainers. OOPS! Teeth have memory, and we don’t realize things are moving until it’s too late. I know what you’re thinking, I DO NOT want to go through orthodontics again. We get it, trust me. But with Invisalign, your clear, removable trays, make all the difference when comparing to metal wire braces. You are required to wear them for a minimum of 22 hours a day, but go ahead and pop them out while eating. No more worrying about getting things stuck in your brackets! Click on the link below to hear Dr. Emery talk about Invisalign! Still have some questions? Feel free to give us a call or schedule a consultation with Dr. Emery!